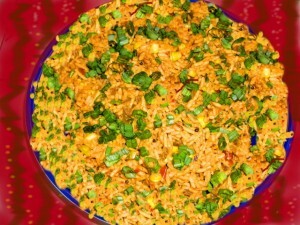 Chicken Masala Rice recipe by Sumreen at DesiRecipes.com. Fry onion , chicken and ginger until chicken tenders. Then add salt , ajinomotto, soy sauce and mix them. Now add rice and garam masala. Then put them on low heat for 5 min. Garnish with corriander leaves and serve with raita or chutney. Note: chicken can be substituted with any kind of meat of your choice. its 1 to 2 cup ie 1-2 cup not 12 cup where z the spice in this recipe? Ajinomoto not good for health. Hahaa ur recipe is v v v bad. Its as though the rice is the topping on the chicken instead of the chicken being dressed over the rice! with soooo lesz rice and.so much chicken!